Big Brother is no longer simply watching. He’s now taking an active role, in everything. So suggests the musical Be More Chill at The Pershing Square Signature Center. Boasting one of the most enthusiastic audiences in recent memory, and based on the novel of the same name, the show presents a refreshing new take on the oft-told tale of someone trying to become one of the cool kids. Jeremy (Will Rolland), now in his junior year at a New Jersey suburban high school, just wants to survive it. A self-described “geek”, he’s regularly tormented by jocks and looked upon with disdain by the popular girls. Even Christine (Stephanie Hsu), a sensitive sort he would love to ask out, gives him little more than the time of day. Meanwhile at home, Jeremy’s Dad (Jason Sweettooth Williams) is going through a major downward spiral in the wake of his wife’s departure, and is no longer emotionally there for his son. Jeremy’s one great joy is spending time with his longtime friend and fellow social outcast, Michael (George Salazar). The song “Two-Player Game” giving a nice overview on the depth of their friendship. Things change for Jeremy when Rich (Gerard Canonico), a fellow junior, and one of Jeremy’s major tormentors, suddenly offers him the chance to jump to the top of the school social ladder. All thanks to a Squip. A grey oblong pill which, when taken, will show him how to make his dreams come true. Just as it has already done for Rich. No one now remembering him as the loser he used to be. Even Jeremy. The Squip (Jason Tam) is, in actuality, a kind of supercomputer. Appearing inside Jeremy’s head in the persona of Keanu Reeves, it begins mapping out a course for Jeremy’s future. In short order, Jeremy starts to become one of the popular kids in school and gets invited to the important social gatherings. At the same time, he finds himself becoming estranged from Michael. The Squip explaining how Michael is no longer someone with whom Jeremy should associate. As with many works of this type – Heathers and Mean Girls are two that immediately come to mind – the real issue facing Jeremy is the importance of staying true to what you believe. Rather than being coerced or convinced to go along with everyone else, simply because that’s the easier thing to do. Coupled with this is a warning to beware opportunities which seem too good to be true. It eventually becoming apparent that Jeremy and the others may be pawns in a much bigger plan. One which has to do with conformity and free will. Or the lack thereof. 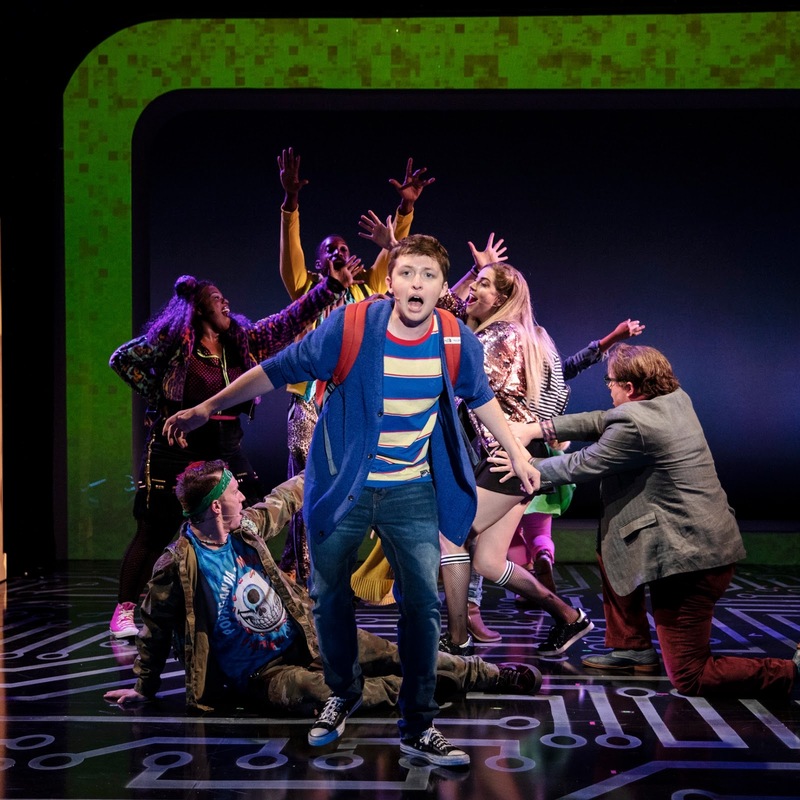 Despite its various messages and more than a few serious moments, the heart of Be More Chill is its underlying sense of fun. The work often feeling like a spoof of the very situations it seeks to explore. More importantly, the musical never hits the audience over the head with its message, nor does it ever talk down to them. The entire show akin to a technological thrill ride through the territory that is teenage angst. A good part of the show’s success due to the strong work by lighting designer Tyler Micoleau, and the excellent projection design efforts by Alex Basco Koch. 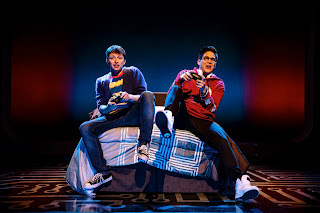 Be More Chill can also be called “the little musical that could’. The show seeming to reach the end of the line after a regional production several years ago. However, thanks to a cast album and strong word of mouth, the work became a cult hit with an enormous online fan base. Its growing popularity leading to this current theatrical rebirth. One which will continue with a move to Broadway in 2019. The score by Joe Iconis is enjoyable, if not always memorable. Direction by Stephen Brackett is, for the most part, rock-solid. The only missteps occurring during several early transitional moments, when cast members switched between singing and dialogue. These shifts not coming off as seamlessly as they could have. There was also a running problem with the music being too loud, it often drowning out the various song lyrics. Roland gives a superb performance as Jeremy, a conflicted kid who just wants to fit in, and hopefully get the girl. Hsu is fine as Christine. Someone who, like the rest of the students, is just trying to make it through high school. Talia Suskauer (who subbed for Lauren Marcus the night I saw the show) and Katlyn Carlson worked well as the so-called “popular girls”. Salazar was nicely stalwart as Jeremy’s loyal friend Michael, while Tam did a great job as the mysterious Squip. Williams does a nice turn as Jeremy’s Dad. Particularly in the serio-comic number “The Pants Song”, when he realizes he has to do more than try to be Jeremy’s buddy. He has to start being his father again. 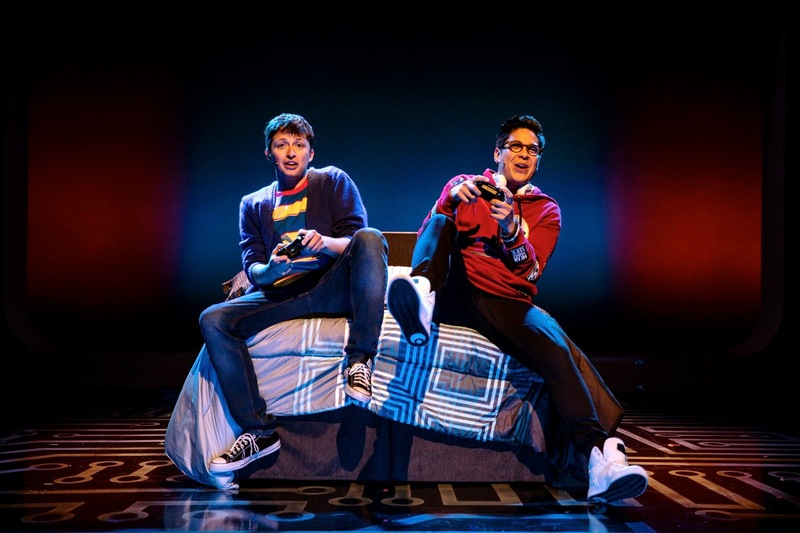 Be More Chill makes for a welcome addition to the New York theatre season and is heartily recommended. 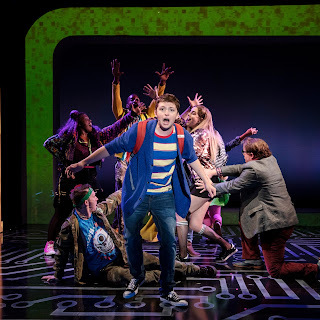 Featuring: Gerard Canonico (Rich Goranski), Katlyn Carlson (Chloe Valentine), Stephanie Hsu (Christine Canigula), Tiffany Mann (Jenna Rolan), Lauren Marcus (Brooke Lohst), Will Roland (Jeremy Heere), George Salazar (Michael Mell), Britton Smith (Jake Dillinger), Jason Tam (The Squip), Jason Sweettooth Williams (Jeremy’s Dad/Mister Reyes/Scary Stockboy).